Located in the heart of the High Sierras and the gold rush country of California, WorldMark Angels Camp is perfectly situated for anyone looking to obtain fractional ownership in Calaveras County. 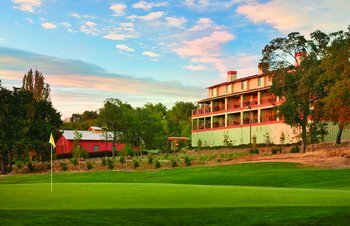 Angels Camp timeshares for resale place the visitor at the center of all the outdoor activities, wineries, golfing, and historical attractions that Calaveras County has to offer. Angels Camp timeshare resales are available for anyone looking to explore this bountiful region. Snuggle up around the gas fireplaces housed within each unit after a day touring the country. The balcony and terraces of each unit provide views looking out over the surrounding golf course and mountains. WorldMark Angel Camp timeshares for resale also have cable television, high-speed internet access, DVD players and stereos. The one, two, and three bedroom units also have a washer and dryer, so visitors don't have to pack too much and can save room in their luggage to take home gifts from wineries, art galleries, and historical venues. WorldMark Angels Camp fractional ownership also gains visitors access to both and adult and children's outdoor swimming pool and spa area. The club has outdoor basketball and tennis courts, children's play area, ping pong and pool tables, an arcade and fitness center. This is a great place for the entire family to kick back and relax. Located deep in the Sierra Nevada gold rush territory, this is a great area to pan for gold, go horse back riding, or hiking and biking in a location rich with wildflowers and colorful foliage. Buying a WorldMark Angels Camp timeshare places visitors on the Greenhorn Creek 10th fairway and within striking distance of both the Sequoia Woods and Saddle Creek Resort golf courses. WorldMark Angels Camp is also located in the center of High Sierra wine country, offering visitors an array of wineries and fine dining options. Art galleries and antique shopping line the streets of Angels Camp as well as the surrounding towns. The Calaveras County Fair and Jumping Frog Jubilee also take place in Angels Camp, and the area boasts many other activities like canoeing and kayaking, swimming, skiing and sledding, or spelunking in limestone caverns. Calaveras County is home to several casinos, Calaveras Big Trees State Park famous for its sequoia trees, and Columbia State Historic Park. Calaveras County and its only incorporated city, Angels Camp, sit in a warm Mediterranean climate, keeping the outdoor attractions comfortable year-round. If there in the winter though, a short drive up the mountains will place visitors in deep snow perfect for skiing. The Bear Valley Ski Area is happy to welcome wintertime WorldMark Angels Camp timeshare owners. Fields brimming over with wildflowers can be found in the spring, and the changing colors of the fall welcome late season guests. The warm summers are perfect for swimming in mountain runoff or in the New Melones Reservoir. Contact Premier Timeshare Resale if you are looking to buy a WorldMark Angels Camp timeshare. The friendly and helpful sales associates will be glad to help anyone looking to sell a WorldMark Angels Camp timeshare as well. WorldMark Angels Camp timeshare deals can be limited so call Premier Timeshare Resale if you want to gain access to the amazing Calaveras County.